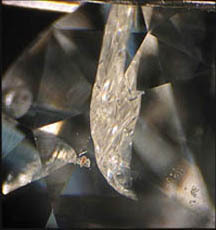 Diamond inclusions are characteristics that occur inside a stone. They are usually called flaws, because their presence means the diamond is not perfect. 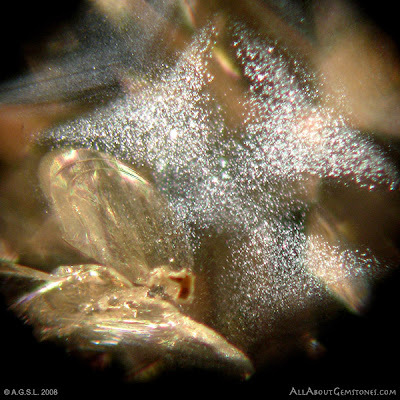 Inclusions are like fingerprints, a characteristic that gives us all a special signature. 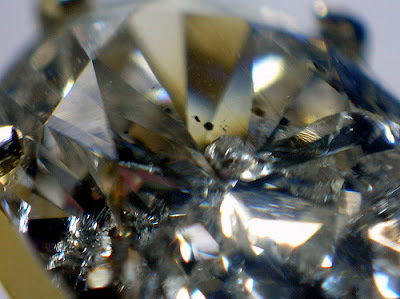 Getting to know your diamond inside and out makes the stone a more personal possession and will help you describe and identify the gem if it is ever lost or stolen. 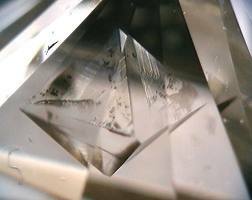 Some inclusions affect a diamond's clarity, making it less brilliant because they interfere with light as it passes through the stone. 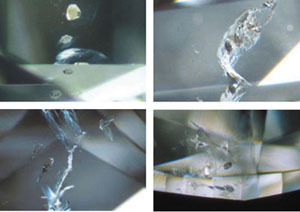 Other types of diamond inclusions can make a gemstone vulnerable to shattering. 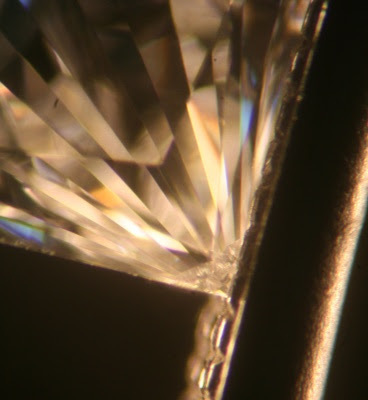 There are few perfect diamonds, and the ones that are perfect are quite expensive, so the diamonds we buy all have varying amounts of internal and external flaws. 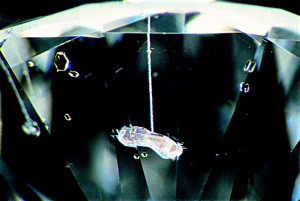 Most jewelers tell us not to worry about diamond inclusions if they do not affect the stone's strength or seriously impact its appearance. 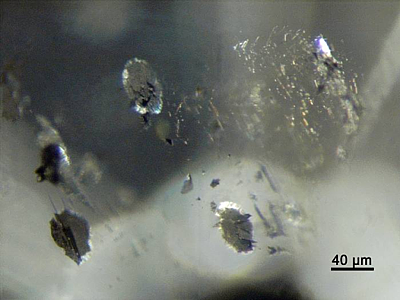 Diamonds can have tiny crystals and minerals imbedded in them, even other diamonds. 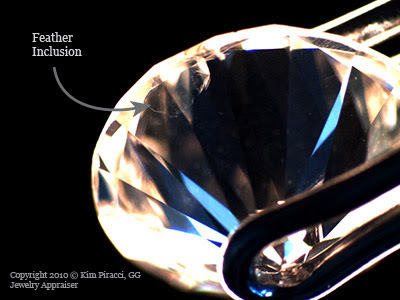 Many cannot be seen without magnification, but a large chunk or grouping of crystals that detracts from a diamond's appearance lowers its clarity grade, and its value. 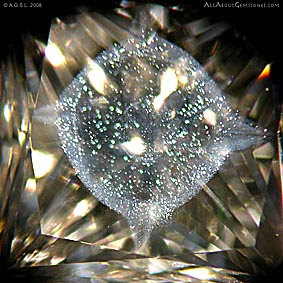 There are times that a small crystal can add character to a diamond. A diamond with a small garnet imbedded in it would be a great conversation piece--and a personal choice for someone whose birthstone is a garnet. Pinpoints are tiny light or dark crystals in diamonds that appear by themselves or in clusters. 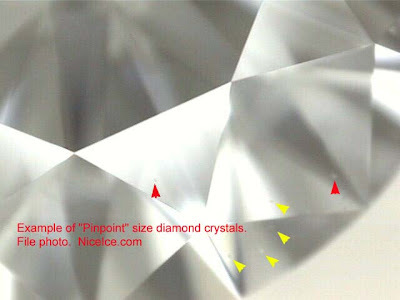 Larger clusters of minute pinpoints can create a hazy area in the diamond, called a cloud, which affects the diamond's clarity. 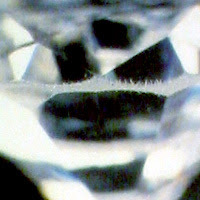 Laser lines are not a natural diamond inclusion. 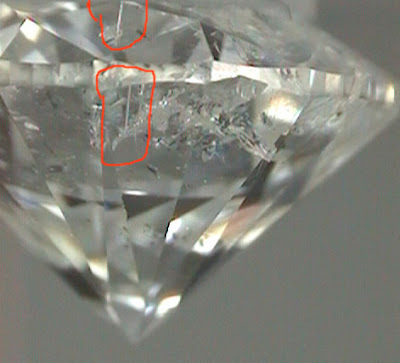 These vapor-like trails are left behind when lasers are used to remove dark inclusions from the diamond. 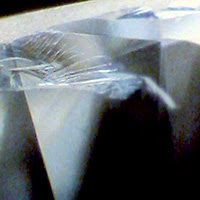 The machine-made trails look like tiny strands of thread that begin at the diamond's surface and stretch inward, stopping at the point where the inclusion was removed. 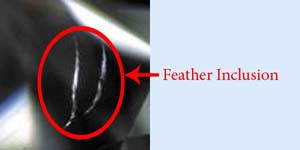 Feathers are cracks within the stone that resemble, well... feathers. Small feathers do not usually affect a diamond's durability unless they reach the surface on the top of the stone, a location that's prone to accidental blows. Girdle fringes, or bearding, are hair-like lines that can occur around the girdle during the cutting process. Minimal bearding is usually not a problem, but extensive fringing is often polished away or removed by recutting the diamond. Always shop for diamonds at a jewelry store you trust and find someone who can answer your questions about the diamonds you are considering. 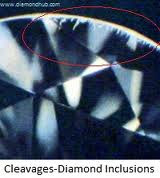 Ask the jeweler to show you each diamond under magnification and explain its characteristics to you. This might be a nice place to learn something if I didn't have to keep closing windows trying to make money.